The sleepy village of Port Eynon on the Gower Peninsula is dominated by campsites, and static caravan parks occupy various hillside fields above the town. But help is at hand at Skysea (formerly known as Carreglwyd Camping & Caravanning), which has five camping fields, of which only the two nearest reception are favoured by caravans, with tents having the run of the place beyond. Pitches nearest the beach tuck in under the shelter of thick hedges, affording views of Port Eynon bay from the higher ground. All in all, it’s a well-organised and well- equipped site, with modern showers that are both clean and free, plus a very good onsite launderette and a small shop at reception for the basics. But above all its direct access to the beach means that it’s a perfect place for young families, with a half-mile crescent of calm family-friendly waters and plenty of water sports opportunities that makes it kid-friendly heaven during summer. 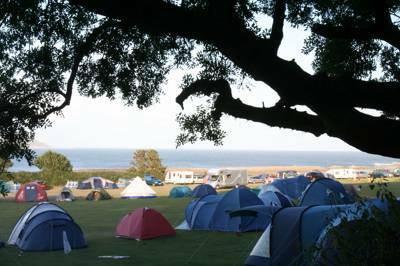 If the sun is a no-show for your camping holiday or if the beach doesn’t appeal, head the other way out of the campsite, where a maze of paths explore the headland. This land is owned and managed by the National Trust, but it feels wild and untamed. There are caves to be found around here as well as Culver Hole, a mysterious four-storey building secreted into the rocks of the headland. Its origin may have been defensive, but it’s highly probable that it has seen more use as a smugglers’ hideout. Besides the beach Port Eynon is a relatively soulless spot, but there’s a more untamed world on the right, towards the tip of the peninsula. This part of the coast is owned and managed by the National Trust, but it feels wilder. Mewslade is a birdwatchers’ paradise while Fall Bay is the best unspoilt beach in the area – only accessible at low tide, but that doesn’t stop many campers wading there or scrambling over the rocks to this idyllic bolthole. The coastal path to Worm’s Head and Rhossili is a spectacular five-mile walk, showcasing the most dramatic stretch of Gower coastline and possibly the best sunset in the UK – proof alone, if it were needed, of why Gower was selected as Britain’s first official Area of Outstanding Natural Beauty. Our campsite: Skysea Caravan & Camping Site was renamed in January 2018. Our campsite was previously called Carreglwyd Caravan & Camping Site. Feel free to read Carreglwyd reviews and information online. The campsite is still owned and run by the same family... it is only the name we have changed! 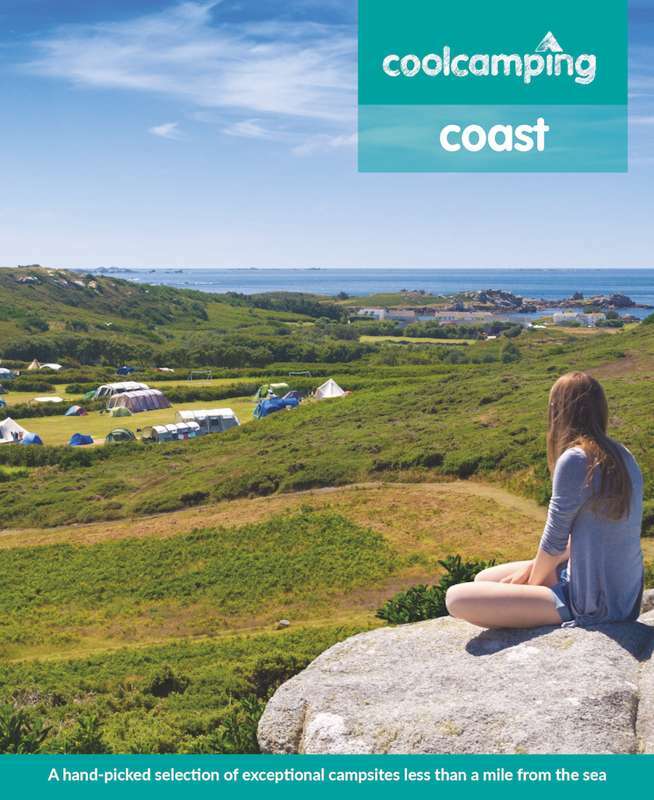 Skysea is a busy, beach-side camping park on the South Gower Coast, overlooking the picturesque village and Bay of Port Eynon. 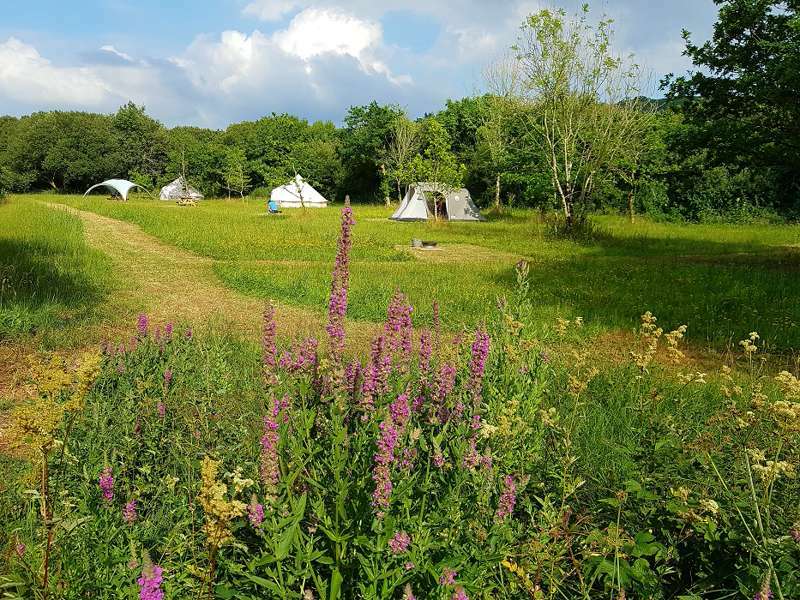 The fifteen acre site is surrounded by steep cliffs to one side and magnificent coastline on the other, and accommodates caravans, motorhomes and tents in five well-drained and maintained fields. The Gower Peninsula is little more than fifteen miles long and five miles wide, and is unique; the coastal scenery is unsurpassed – rugged limestone cliffs and rock-bound shores alternate with splendid sandy bays, each with its own characteristic and individual allure. The almost insular character of Gower has been the main factor in the preservation of the old-world atmosphere which appeals to so many of its visitors. From the Skysea, you can directly access the Wales Coastal Path (Free walkers map available at reception). The Swansea and Gower section of the path hosts some of the most beautiful scenery in Wales, and is not to be missed. Warm accomodating Hosts , very friendly and helpfull, upgrading in progress with the one Toliet Block , wonderfull views good walking base . Been to this site 3 weekends in the last 4 weeks very relaxing. Site is family and dog friendly, all pitches have equal spaces, very quiet ideal for couples and families. The entrance is via a barrier which will be opened by staff once you have booked in there is no driving around the site once pitched, the main gate is locked between the hours of 11pm and 8am, site is very safe and extremely clean. Unfortunately we found the reception somewhat disgruntled and unwelcoming , quizzing us as to the nature of both our visit and dictating a list of prescribed campsite rules all at the discretion of the owner including the threat of removal if same not adhered to ( we were three men in their fifties to seventies thus not teenagers on a jolly and capable of comprehending simple rules ). The views and location were both wonderful and accessible , however the toilet and washing blocks could benefit from a degree of renovation to increase both aesthetics and functionality . We did note an ongoing upgrading programme on the water and electrical points in some of the camping fields . Definitely a site with great potential if developed both effectively and sympathetically with its surroundings . Clean well run site, owners well organised and very helpful. It had nice roomy pitches. Toilets and showers were of a good standard. Lovely campsite, close to the beach. Owners verys helpful (leant me an extension lead for the electric hook up). They couldn't do enough for us. Very well kept. shower blocks and toilets very clean and even when full, we didn't hve to queue and plenty of hot water. Not overcrowded even when full. It's the best one I've stayed on in the Gower. We stayed here for 3 nights in late July with our 1 year old son. The campsite was not over crowded and we could pick our spot. The staff were helpful and friendly. The site had all the facilities we needed and the location was perfect, we did not move away from Port Eynon during our stay on the Gower. There was a great friendly atmosphere on the site and we will definitely return in the future. We stayed at Carrreglwyd at the beginning of November as it was one of the few sites on Gower open all year round. Previous reviews had described the reception as unfriendly and even rude. Quite the opposite. The person who greeted us could not have been more welcoming and helpful. We were guided by her to a lovely level pitch with a sea view (which I think you get from all over this site which is practically on Port Cynon beach.) The camp site facilities were pristine and of a high standard. There is an excellent pub with good food and a fish and chip shop within five minutes' walk. Both staff and locals in the pub were very friendly and you couldn't get far along the beach without someone stopping to chat! Altogether a very positive and relaxing experience. We'll be back! It's not cheap but you get what you pay for. great campite for friends or family, you can walk down to the beach in a few seconds. The fish and chip shop right by the campsite is very tasty too! Checked in on the Friday evening – I had spoken to the owner a couple of days before and whilst I was concerned he wouldn't allow us (3 girls) to camp he was fine when I explained that we were an adult couple with friend. The whole process was straightforward. The dogs were free and received lots of attention wherever they went. The facilities on the site were of a good standard. The most exceptional thing though we're the views and proximity to the beach. Not the cheapest campsite but we will be returning before the summer is over. I agree with the person above, the location is hard to beat, but the owners have a reputation of being very rude! We found them to be very unfriendly and the site was very expensive. While I do not dispute the views, the area and all the good things about this campsite. I feel I have to say from check in to check out the customer service on this site leaves a lot to be desired. The way I was spoken to wasnt acceptable - I am not stupid and I do not behave like a naughty child. So perhaps the ladies could consider the tone and manner in which they speak to their paying customers. Thank you. 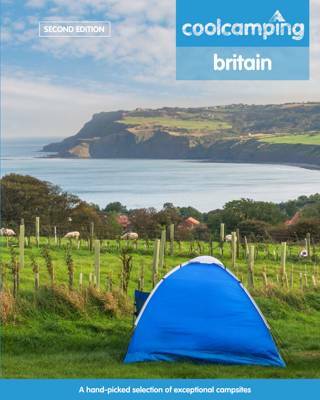 Tents, campervans, caravans, dogs (on a lead at all times), families – yes. Big groups, young groups – no. 2 modern amenities blocks have toilets, hot showers, basins, laundry and washing-up facilities. Outdoor showers are available for wetsuits. An onsite shop sells groceries and camping accessories. Electric hook-ups and chemical disposal points also available. No campfires. It’s just under 30 minutes in the car to Swansea, where the Chocolate Factory (01792 561617, booking essential) is among the attractions. Gower Coast Adventures do boat trips from Port Eynon to Worm’s Head (07866 250440), perfect for spotting gannets, guillemots and even puffins. For those after a water-based adrenalin kick, surfboards can be rented and lessons taken from Sam’s Surf Shack in Rhossili (01792 350519). It’s also the perfect place to paraglide off the headland in Rhossili (01239 614140). Among places to eat in Port Eynon, the Smugglers Haunt (01792 391257) does pizzas and pub grub, while the Seafarer (01792 380879) does decent fish and chips. A 5-mile walk or bus away in Rhossili village, the Worm’s Head Hotel (01792 390512) serves good food that’s very nice washed down with a pint of Worm’s Head Ale. It’s a stunning spot at sunset, and chef Kate Probert does day cookery courses at her home in Three Cliffs (07976 639352). Twelve miles away, in Llanmadoc, you’ll find the Britannia Inn (01792 386624) with estuary views and locally caught fresh fish on the menu. Main courses range from £10.50–16. £20 for 2 people, a car and tent, plus £8 per extra person. Children 4–12 years £1, 13–17years £2. Getting to Skysea is easy. Take the A4118 from Swansea (signposted Mumbles) and follow it all the way to the end. The entrance to Skysea is just by the beach car park at Port Eynon. Regular buses run from Swansea directly to Port Eynon, stopping a few yards from the campsite entrance.